AUGUSTA -- Gov. Paul LePage's energy director says the governor's recent promise to fast-track natural gas infrastructure projects and lower energy costs for residents and businesses will mean streamlined state environmental permitting, new programs to help Mainers convert to natural gas and other alternatives to oil heat. AUGUSTA — Gov. Paul LePage’s energy director says the governor’s recent promise to fast-track natural gas infrastructure projects and lower energy costs for residents and businesses will mean streamlined state environmental permitting, new programs to help Mainers convert to natural gas and other alternatives to oil heat. However, the two companies competing to bring natural gas to the Kennebec Valley already have most state approvals they’ll need and cite no problems with Maine’s regulatory process, saying it has worked fine for them. Even so, company officials said they welcome any help in converting Maine homes, businesses, and government and school buildings to natural gas. In his State of the State address last week, LePage said Maine’s energy costs are too high, singled out natural gas as an energy alternative that could help lower them, and vowed to take steps to speed and ease the construction of natural gas projects in Maine. He said the average Mainer spends more than $3,000 a year on heating oil and could save $800 a year by switching to natural gas. In an interview, Energy Director Patrick Woodcock said natural gas projects should be encouraged and hastened, primarily by making Department of Environmental Protection permit processes faster and less complicated. The 21-page Wind Energy Act of 2008 was approved during the Baldacci administration, following the recommendations of his Governor’s Task Force on Wind Power Development. It was designed to speed up the permit process for developers. Woodcock said the state should take similar steps for natural gas. Any changes in those processes aren’t likely to speed development of natural gas in central Maine, where Maine Natural Gas and Summit Natural Gas of Maine largely already have their permits. 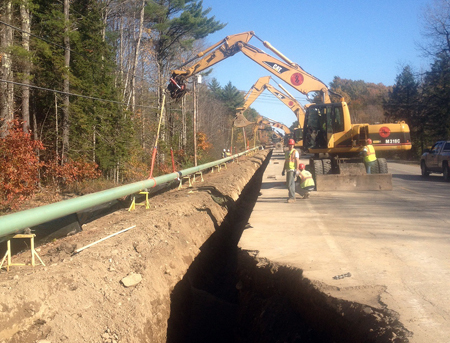 In the case of Maine Natural Gas, the firm already has started laying pipe in the ground. Summit plans to do so this spring as soon as the weather allows. Officials from those firms say they haven’t a hard time getting permits, but there has been one complication. Both companies submitted bids in response to a state request for proposals last year to provide natural gas to state facilities in Augusta and Gardiner; however, the state’s efforts to strike a deal for natural gas to heat state buildings were scuttled. An appeals panel ruled in September that the bid process used by the state Bureau of General Services to select Maine Natural Gas as the provider was flawed and invalid. Maine Natural Gas has since filed a lawsuit, which the courts have yet to decide, contesting the state’s approval of Summit’s appeal. “One item that could help encourage natural gas expansion is to reissue the (request for proposals) for natural gas service to all the state facilities in the Kennebec Valley so we can have the opportunity to appropriately design our distribution system,” said Tim Johnston, executive vice president of Summit Natural Gas of Maine, a subsidiary of Colorado-based Summit Utilities. Woodcock said LePage is frustrated that the state hasn’t been able to convert state office buildings in Augusta to natural gas. He said the buildings use about 220,000 gallons of oil annually. However, Woodcock said he couldn’t discuss when the state would issue a new proposal request because of the unresolved legal issues looming over the failed first attempt. The Department of Environmental Protection, the Public Utilities Commission and the Department of Transportation “have all been very helpful and have worked to streamline the process while remaining consistent with their regulatory mandates to achieve the goal of expanding natural gas service in Maine,” Johnston said. Officials from Maine Natural Gas, which is owned by Iberdrola USA, the parent company of Central Maine Power Co., are also comfortable with the state’s current permit process. Samantha Depoy-Warren, spokeswoman for the DEP, said a new natural gas pipeline would need permits from the Division of Land Resource Regulation. She said the exact permits needed would depend on the scope and size of the project. If the pipeline would be next to or cross a wetland, stream or other water body, it probably would need a Natural Resources Protection Act permit. She said the DEP’s guaranteed processing times on such permits are 90 to 120 days. In 2012, the DEP’s average processing time was 56 days, which Depoy-Warren said is a 21 percent improvement from the 71-day average in 2010. DePoy-Warren noted other DEP permit processing times also have improved since prior years, but said even speedier processing is possible. LePage and Woodcock said the administration also is working on a plan to help Mainers convert from oil to other less costly heating fuels, natural gas included. That cost of helping consumers, Woodcock said, could be offset using funding Maine receives through the Regional Greenhouse Gas Initiative, a partnership including Maine and eight other Northeastern states. The initiative, in an effort to reduce greenhouse gas emissions, places caps on carbon dioxide emissions in member states. Emissions allowances are then auctioned off to businesses, and the states get the proceeds of the auctions. Since the auctions started, in 2008, Maine has received just more than $34 million, including $1.2 million in the most recent of the 18 auctions. Now those funds are allocated to the Efficiency Maine Trust for energy-efficiency programs. LePage said in a Feb. 7 announcement he would support proposed reforms to the initiative but only if Maine alters how it uses its share of auction proceeds. Rather than using them for energy-efficiency programs, LePage said he will introduce a bill to use the money to reduce electricity rates for businesses and lower heating costs for Maine families, by helping them convert to cheaper heating sources, natural gas included. Woodcock said increasing energy efficiency is a good goal but what Mainers need help with most is their heating bills.